Jump Rope Workout - Get to Jumping! Jump Rope Workout – Get to Jumping! Get to jumping people. A jump rope workout is fast, challenging, intense, and amazing. The Healthy LA recommends a Valeo Jump Rope, but no matter what, jump! Jumping Rope is one of the best workouts for you! Ask yourself, why do professional boxers jump rope so much? I’ll tell you why. It’s because a jump rope workout is an awesome cardio endurance workout. It torches calories and melts fat. You’ll feel it all over your body. Plus, it’s a portable workout perfect for travelers, couch surfers, or jet setters. You can jump rope anywhere! All you need is a jump rope and a little space and you’re good to go! Growing up, my mother used to jump rope all the time. She’d go down to our garage and jump for what felt like an hour. Her jump rope workouts were intense! I’d watch her and chat with her as she jumped so effortlessly. I always thought it looked like fun, and on some occasions I’d even join her. But it wasn’t until I got older that I saw how versatile, simple, and amazing it was. Her jump rope workout was a workout she could do any time of day. She often jumped at night and she always looked so very sweaty when she was done. It was challenging, intense, and worry free. I bought a jump rope years ago, when I first moved out of the house. No fitness buff should live without one. It’s been my go-to vacation workout! It’s so easy to pack a jump rope. It barely takes up any space and anywhere you go, you can find some space to jump rope. Jumping rope is definitely an exercise that can get monotonous. I rarely jump without music, and I love jumping rope in intervals. Interval training with a jump rope adds back in the fun. You can set your interval timer to a ton of workout varieties. I switch off between jumping for two and a half minutes with a minute and a half rest, and jumping for one minute with a minute rest. If you’re just beginning, definitely try five cycles of this, but once you’re more experienced do ten cycles. We’ll get more into intervals in another post, as the GymBoss interval timer is the perfect jump rope workout compliment. Keeping things simple with your jump rope is great too. Try setting a ten minute timer and jumping the whole time. Take a rest and then set another ten-minute timer and jump again. Wow! If your stamina is good, rest again and set a final ten-minute timer. Talk about challenging. If you don’t need the rest, then go for thirty minutes of straight jumping rope. Be warned, this is intense! You’ll be sweating and huffing and puffing by the end. As long as you have a partner to do it with, or a good music playlist, thirty minutes will go by quickly! If you’re into circuit training then you can also create a circuit with your jump rope. I enjoy both counting to 100 and setting my interval timer for two minutes of jumping. Once finished, I go straight into jumping jacks, followed by jump squats, followed by crunches. Start out by doing five sets, then work your way up to ten. This is a fabulous add-on workout, but also a great holiday workout! Make sure you start jumping now, so wherever you’re traveling this holiday season you’ll already have a good jump rope basis for those workouts. Adding in any of these jump rope workouts, or doing a different one each day, keeps my vacation workouts fresh and my daily exercise unique and enjoyable. It also torches my body! Jumping Rope is not for the faint. You’ll be sore all over. Go out there and get your jump rope on! 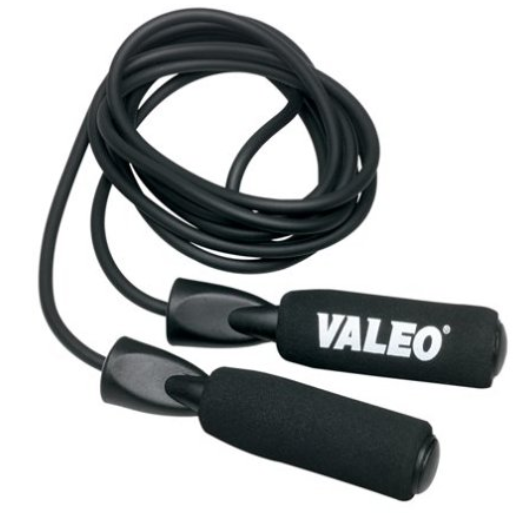 Valeo makes a great jump rope (found here on Amazon), but as long as you have one, you’re all set. They’re super cheap and you can order one right now for less than seven bucks. Woo! A Jump Rope workout is definitely an intense workout! Make sure you add that boy in, especially this holiday season. Previous PostPrevious The Perfect Running Shoe for you!